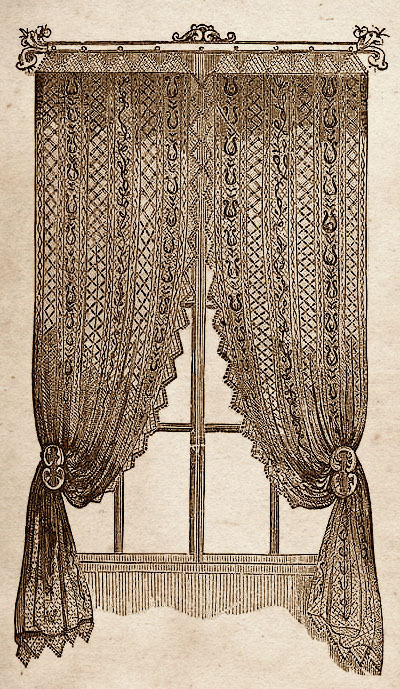 A beautiful example of a Victorian netted curtain from 1858. Instructions are given in how to recreate this very pretty window dressing yourself. So if you are handy with needlecraft then this is for you. Material–One and a half pounds of Knitting Cotton, No. 10. Meshes–No. 12 and 14 Bell Guage, one flat Mesh, half an inch wide, and one, a quarter of an inch wide. Steel Netting Needles. With mesh No. 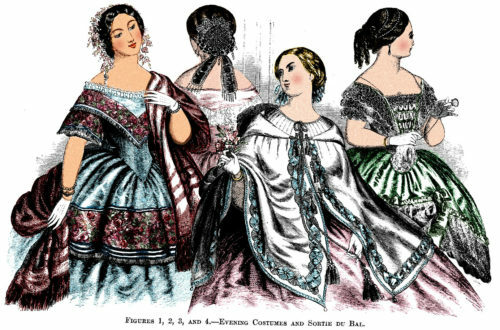 14, work four rows plain, and for the diamonds, fifth row, net one plain stitch, and then turn the thread round the mesh and net one plain stitch; repeat these two stitches to the end. Sixth row, all plain. Seventh row, turn the thread round the mesh, net a stitch, then one plain stitch ; repeat these two stitches. Eighth row, plain. Repeat the last four rows five times more, then work three rows plain, and then repeat the open stripe. Mesh No. 14 ; work thirty-six rows plain, then repeat the open stripe, then the diamond stripe, then the open stripe. Mesh No. 14; work thirty-nine rows plain, then repeat the open stripe, diamond stripe and open stripe. Work the third embroidered stripe the same as the first, then repeat the open stripe, and net four rows plain. This makes a curtain one yard wide, and if required wider, repeat the diamond stripe and the second embroidered stripe. Mesh No. 12; net seventeen plain stitches on the last row of the curtain, turn back. Second row ; net the seventeen stitches, turn back. Third row ; net sixteen stitches, turn back, leaving one stitch. Then fifteen rows same as the last, working one stitch less each time. Cut off the thread and commence the next vandyke on the eighteenth stitch of the curtain. Repeat the vandykes along one side it the top and bottom. 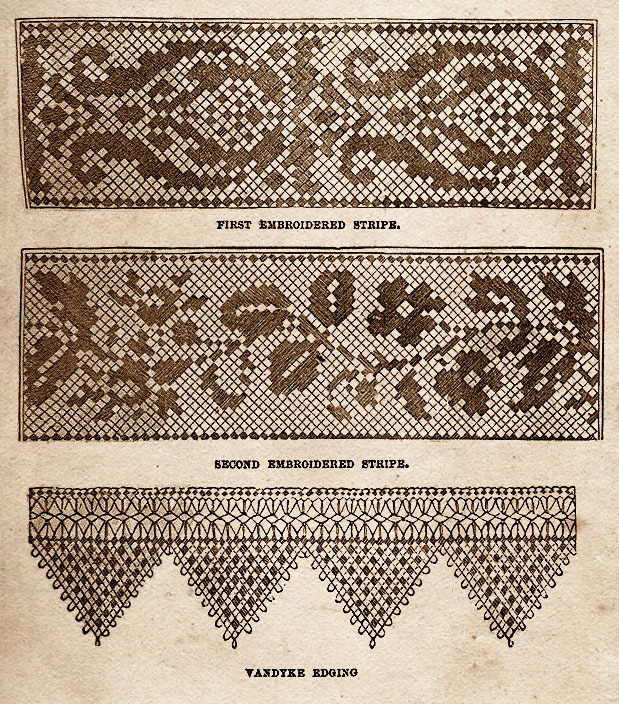 The patterns are embroidered with the same cotton and a rug needle, in the usual manner, that is by passing the needle under and over the stitches of the netting about five times, taking care to turn the stitches the same way as marked in the engravings below. The beading at the edge of the stripes should also be worked on the four plain rows of the diamond stripes. 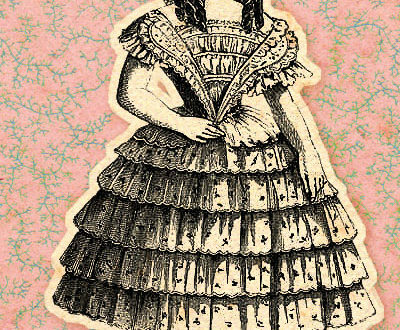 The vandykes are embroidered in the same manner.